Hay wagons sitting in a snowy field near LaFayette, New York. Nikon D700/28-300VR, 1/400s, f/10, ISO 200, EV +0.3, 62mm focal length. If you are like me, you may need some help for this month’s assignment on Black and White Photography. Luckily for us, I found this FREE 7-page eGuide from Light Stalking on Black and White Landscapes: How to Capture a Proper Tonal Range. It has helped me to look back into my photo library and find good candidates for Black and White conversions and to find subjects for new black and white compositions. 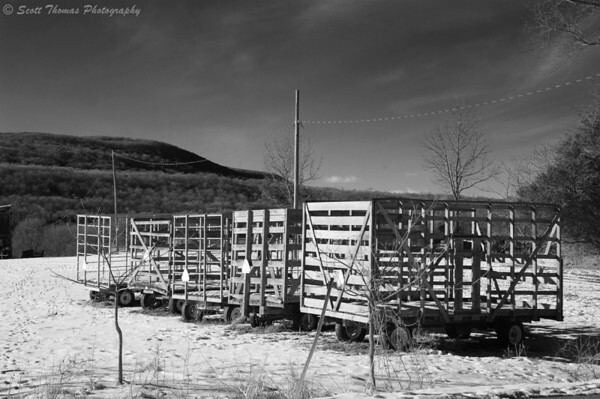 This entry was posted in Photography and tagged 28-300mm, black and white, hay, lafayette, landscape, new york, nikon D700, snow, vr, wagons, winter. Bookmark the permalink.